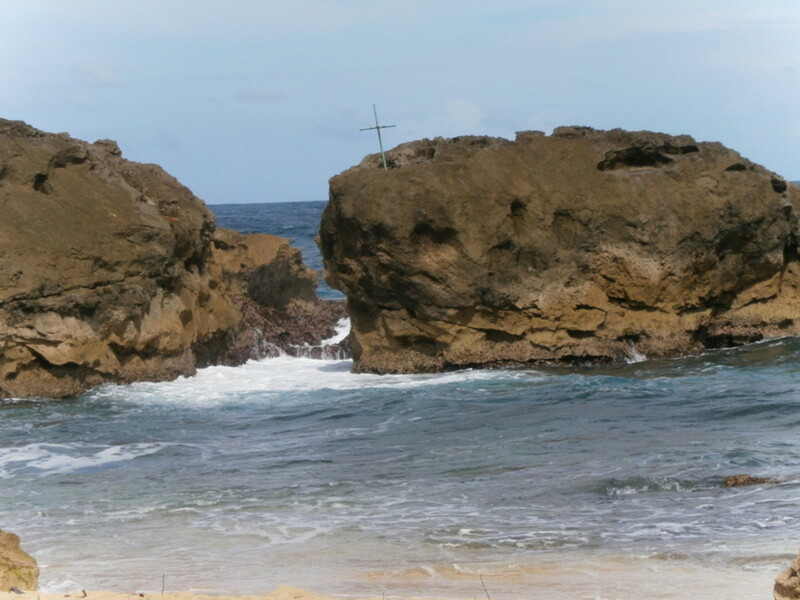 Mary spent time in Puerto Rico and likes to share her adventures in this beautiful spot in the world! Purchase a good travel book. I like Frommer's. He gives the traveler good advice on itineraries for your length of stay, routes to drive if you rent a car, good places to eat, and good places to stay. Take a copy of your passport. You probably won't need it, but it's always good to have. Make sure you have your Driver's License. You will definitely need that to fly to Puerto Rico. Take only a little cash. There are ATM machines every where. Leave all of your jewelry at home. I advise this wherever you travel. I'm sure you wouldn't leave home without your cell phone and charger, would you? Take your laptop computer with all the cords, etc. Don't forget your camera unless you take all your photos on your phone. Pack cool, casual clothes. Remember Puerto Rico is a tropical island. Take one fairly dressy outfit for going to a nice restaurant for dinner or to a casino. Good comfortable shoes are a MUST. You will be walking a lot, and maybe hiking. 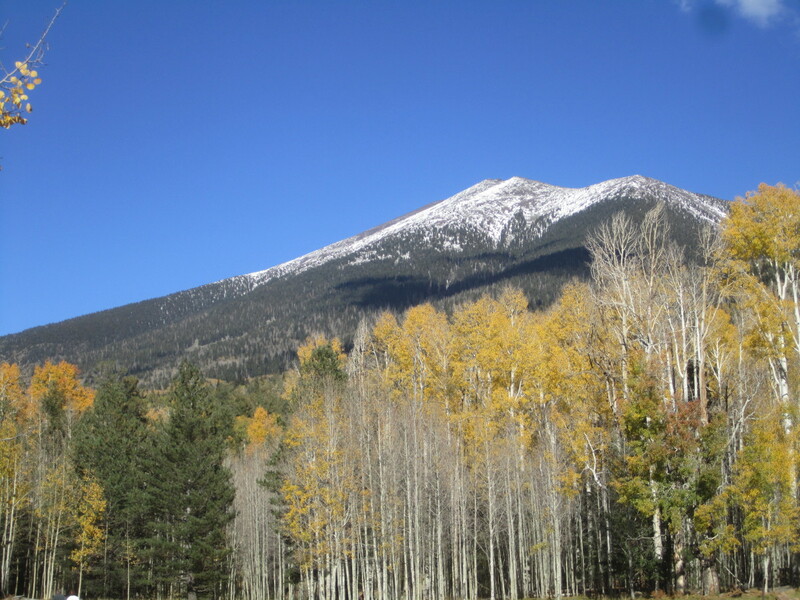 If you plan on hiking, you must bring your hiking shoes! Pack a comfortable pair of sneakers along with your sandals (or flip-flops). Take your prescription drugs. There are drug stores everywhere, but you don't want to run out of your prescriptions. Puerto Rico is an unincorporated territory of the United States, located in the northeastern Caribbean, east of the Dominican Republic and west of both the U.S. Virgin Islands and the British Virgin Islands. The United States acquired the island in 1898. The people consider themselves American, but they are very proud of their island and their culture. Puerto Rico has miles of white sandy beaches, mountains and valleys, and many natural wonders. In addition to the splendors you will find yourself surrounded by warm and friendly people. I found the people very polite which is a trait that I really like. The 3.966 million people that inhabit the island of Puerto Rico make it one of the most densely populated islands in the world. There are about 1,000 people per square mile. Even though the main roads have traffic bumper to bumper, the Puerto Ricans yield to one another. A passport is not required for U. S. citizens. A valid driver's license is required to fly to visit Puerto Rico. We didn't have to worry about money exchanges because Puerto Rico uses our currency. 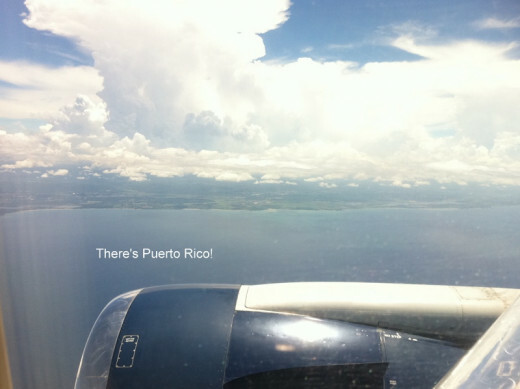 Puerto Rico is the most accessible of the Caribbean islands and is serviced by several airlines. Puerto Rico is about 110X35 miles in size. The Puerto Ricans are friendly. They enjoy showing off their country. Most of them speak English, although Spanish is the primary language. We bought an all inclusive package from Expedia that included airfare and the hotel. It was a very economical package for around $1,200 each. 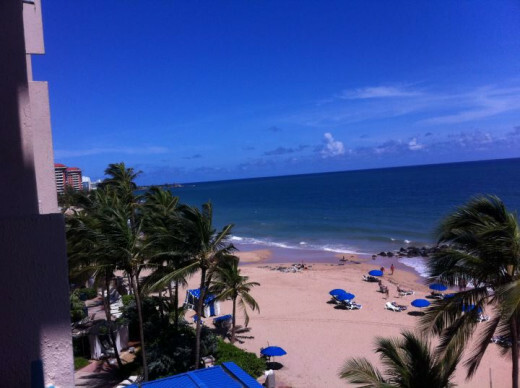 We would stay at the Marriott Resort and Stellaris Casino right on the beach and in the town of San Juan, the capital of Puerto Rico. San Juan is a large city with many sky scrapers. We would book our daily adventure tours from the hotel. The hotel had advised us the tour companies would pick us up in the morning and return us to the hotel in the evening. 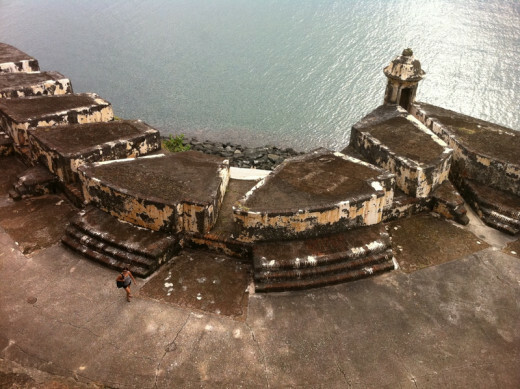 We read Frommer's Puerto Rico Travel Guide for help in planning our itinerary. That was invaluable information for us. Ideally, you should spend two weeks in Puerto Rico to go from coast to coast, but we crammed a lot into our six days as you will see. I kept a daily journal of our trip. This trip was a wonderful adventure. Puerto Rico has many interesting things to do and places to go. I’d like to share our vacation with you. We left Ft. Lauderdale, Florida at 7:00 a.m. for Puerto Rico. 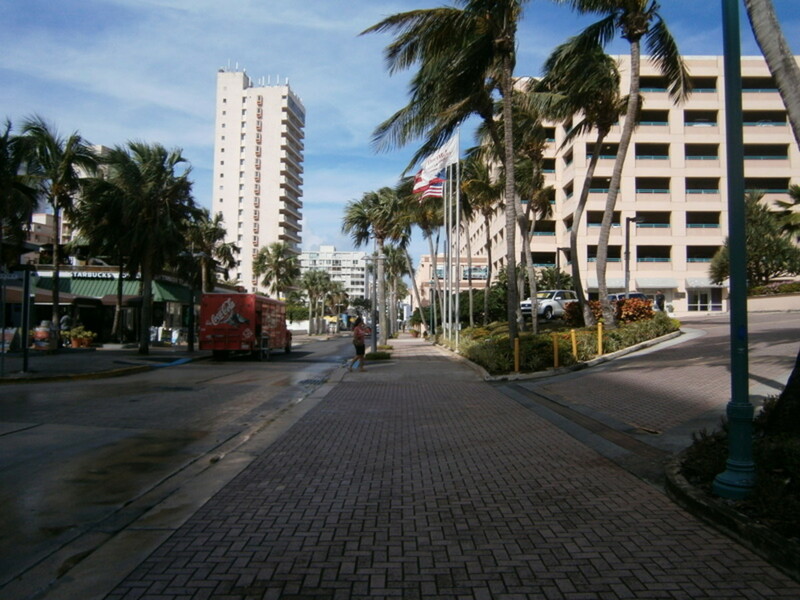 We arrived in San Juan at 9:00 a.m. We were met at the airport by an employee of the Marriott Hotel. 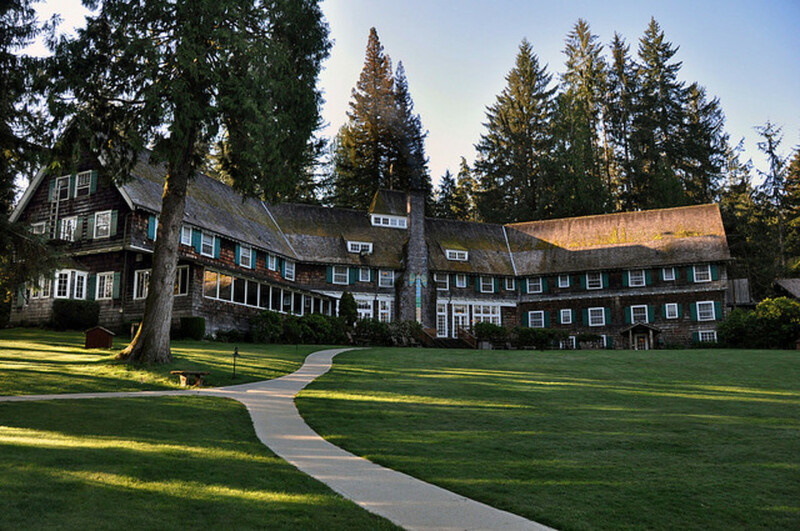 This hotel will be our home for the next six days. We went walking to look for a restaurant where we could find authentic Puerto Rican food. I couldn’t help but notice the sidewalks were in excellent condition: no cracks or pot holes. We saw very little litter on the streets and sidewalk. There are many cabs around, and these are newer model white vans, not the usual yellow cabs we see in other cities. We were told by one cab driver that their vehicles have to be inspected on a regular basis for cleanliness and safety. We decided on a place called Café Del Angel: “real Puerto Rican food,” the sign said. I’ve heard so much about Mofongo; I just had to try that. We also ordered Canoa. I took one bite of the Mofongo, and decided I didn’t like that at all. I tried two or three more bites to make sure I gave it enough time to make a decision. Now, I was sure I didn’t like it! Now to try the Canoa: I can’t begin to describe this dish. It was like Taco filling like we’re accustomed to, with sour cream (and I don’t know what else) inside a plantain. That was pretty bad, too. Holly liked the Canoa, I did not. From where I was sitting, I could see a guy eating the most delicious looking sandwich: it made my mouth water. I was ready to ask him where he got that lovely sandwich when I saw the Subway wrapper! On the walk back to the hotel, I stopped at Walgreen’s and got a Butterfinger and called that lunch. We went to Old San Juan by bus. It was standing room only. I stood and held on for dear life. The driver asked me how old I was. I thought he was being fresh until he told me I rode free. Seniors ride the buses free! Seniors have free admission to all the national parks, too. They also get discounts on many other things like the movies. It pays to be old in Puerto Rico. 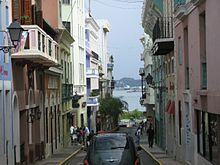 Old San Juan was founded in 1521. It has the beauty of a centuries' old walled city with cobblestone streets, two fortresses, historic buildings, a unique mix of shops, restaurants (some very familiar: Pizza Hut, Subway, and many others), and museums. 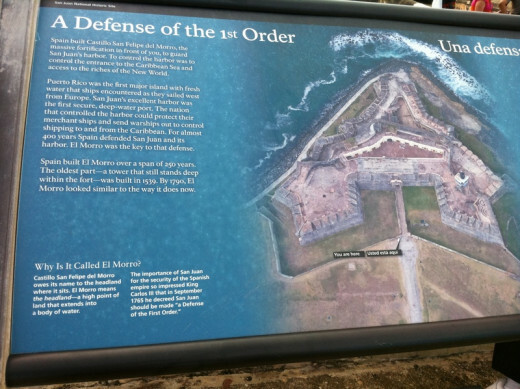 The main fort is called El Morro where you can see the historic Spanish wall that was built to protect San Juan Bay’s deep harbor from attack by sea. Old San Juan has many old churches and wonderful residences and gardens. It is a cultural district with theaters, clubs, bars and restaurants. Shops of all kind line the cobblestone streets. 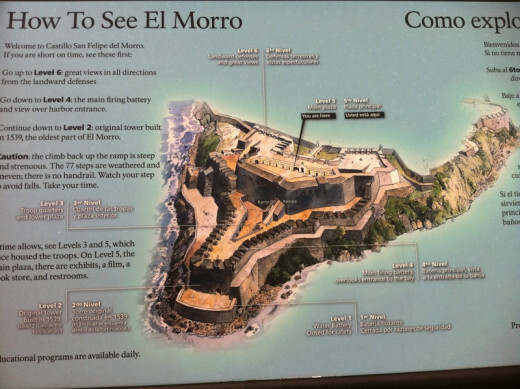 We took two hours just to stroll the streets of Old San Juan, eat and shop; then we headed for the El Morro fort. We stayed there for about two hours. We enjoyed watching everyone playing in the big grassy area in front of the fort. There were kites flying, people laying on blankets, and lots of dogs. Some of the dogs ran free, a few on leashes. We returned to the hotel by bus. Since it was dark by this time, I suggested we eat dinner in the Marriott. I didn’t want to walk the streets after dark, because I’ve been told that’s a no-no. We later found this to be completely untrue. The locals come out at night to eat, shop and jog! If you would like to learn more about the beautiful island of Puerto Rico, I invite you to read my other articles about this wonderful place. After spending three weeks in Puerto Rico, I am in love with this Enchanted Island. I'd like to tell you why I feel this way! Costa Rica Or Puerto Rico: Where Should I Go For The Winter Months? I have to make a decision to go to Costa Rica or Puerto Rico for the winter months. Help me decide where to go. 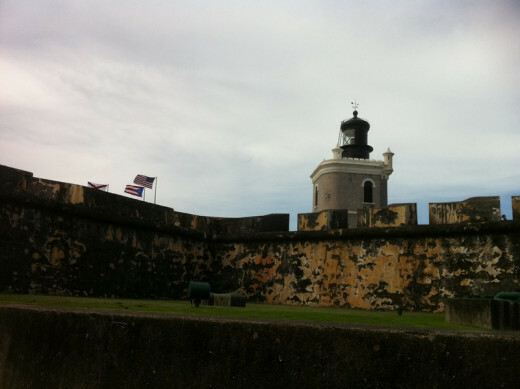 Old San Juan, Puerto Rico; visit to the city and Forts: El Morro and Fort San Cristobal. I stepped back in time when I walked on the blue cobblestone streets. Would you like to go to Puerto Rico? I will consider it now that I am reading about your vacation! Hi, Nell, I'm so happy you enjoyed this Hub enough to come back to it, vote and share! Many thanks! I still think about moving to PR, but I could never leave my family here. Hi Vellur. I hope you will visit Puerto Rico. I know you would love it. I would love to visit Dubai. I've read so much about your country. A great write and an interesting tour that I enjoyed through your hub. Hope to visit Puerto Rico some day. Voted up. Hi lovedoctor926. I'm sure you will enjoy Puerto Rico as much as I did. I'm anxious to go back. When you have some time, read my other Hubs on PR. I have thought seriously about living in PR permantly, but I still have family here that I would miss. Thanks so much for reading and commenting. Hope you have a wonderful trip to PR! Hi ChristyWrites. So nice to see you! I'm happy you found my Hub about Puerto Rico helpful. I really love PR, and I look forward to going back soon. Thank you for taking me on a tour. I'm sure that you had a great time This is actually my summer travel destination for this year. I'm sure that I'm so excited, can't wait. In August, I'm going on a week long vacation to Puerto Rico. My brother recently went on a business trip and I fell in love with the scenery. That is a stunning view from the balcony at the Marriot Resort. I'm planning on visiting the Old San Juan and enjoying the golden sand beaches. Round trip from Miami to San Juan is pretty affordable too. So many useful tips here, Mary! Yes, comfortable shoes would be a must. I like the narration that complements the photos. Too bad about the dinner that tasted badly, but I'm glad you included it as it added authenticity and genuine tone to your hub! Hi, midet38. Oh, I know you would love Puerto Rico as much as I did. It is truly a wonderful place. I'm eager to return soon! Thanks for reading and for the nice compliment on my article and photos, and for the share, too. I am now making this my next holiday destination. 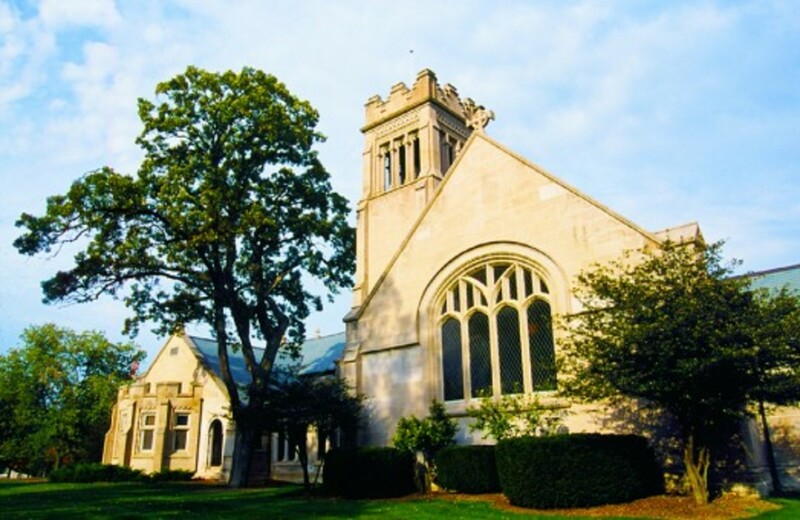 Thanks Mary, for the write up and the wonderfully taken photos! Sharing! Good Morning, Denise Handlon. I'm happy to make you more acquainted with the beautiful island of Puerto Rico. If you want to learn more about PR, I invite you to read my other articles about this wonderful place. Hey there, drbj So glad you joined me on our vacation in Puerto Rico. Yes, I love Puerto Rico as you know. I'd sure like to live there. 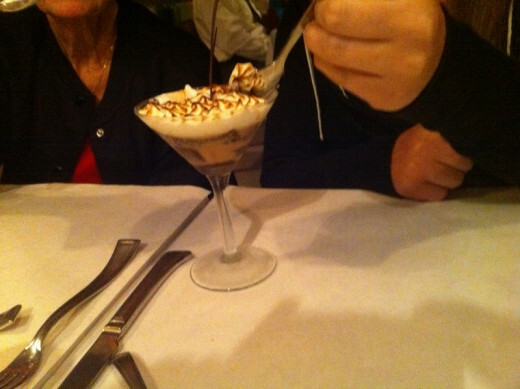 Oh, yes, the food gets better (or I'm getting accustomed to it). Hope you can come along with us on the rest of our vacation. BTW: I have been wondering where my proofreader was??? Hi, MM, Oh, I wish I had your talent for taking photos. This is such a beautiful country. I can't do it justice with my little digital. I can just see the videos and photos you could do! Hey, maybe you can sail away to Puerto Rico someday. I'm so happy you can follow us along on our vacation to Puerto Rico. Oh Mary, I hope you get to eat some decent food on day 2! Now that view from your balcony I could live with - wow! This will be the closest I will ever get to Puerto Rico, so I will follow your vacation with interest! I loved and enjoyed the information Mary, thank you and voted up. 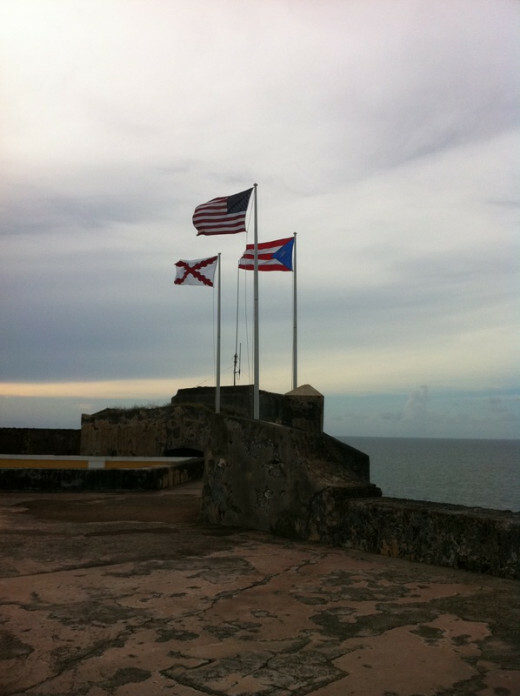 Hi there, tillsontitan, thanks so much for reading and commenting on my Puerto Rico vacation, day one. There's more to come, ha, ha. I have to agree with your Aunt. I cannot say enough about the place. I would like to go there and live. I like the people the country, everything! Voted up, useful, beautiful and interesting. Before I can say more I have to thank you for taking us on your vacation. Your descriptions and details make me feel like I'm there with you. My Aunt was a world traveler and she said one of the most beautiful places she went was Puerto Rico. I knew she meant it because she went back several times. Voted up, useful, and beautiful. Good idea! You can pretend you are there! Of course I will read the rest. I've never been there, and this is the closest I can get to visiting Puerto Rico. LOL I can photoshop myself in some of your photos ha ha ha. Hi there, jpcma, thanks for reading about my vacation in Puerto Rico. I truly love that place. Thanks for the compliment on my photos. I'll publish Day Two tomorrow; hope you'll follow along. I'm sure this was a great adventure. The pictures are great as well. cmontijo, From what I understand a lot of Americans go to Rincon to retire. I liked the atmosphere and the courtyard in the middle of the town. I couldn't find any apartments close to shopping and I won't have a car if I retired there. Yes Rincon is a very nice town :D! my best friend work there at Rincon of the Seas of Hotel, very nice place to stay and enjoy a well deserved vacation. Hi there cmontijo, how nice to see a Puerto Rican here today! I love PR and have been there several times and want to go back for this next winter. I'll be publishing six of these days of our vacation. I write about Rincon on Day Six. I liked that town, too. Hi, LordThanks! Thanks for reading! You know how much I love Puerto Rico. This was a wonderful vacation I took with the two daughters. We had a ball! Day Two will be coming tomorrow, I hope. I'm looking forward to goiong back this next winter. I'll keep your suggestion in mind when I go back...to so the salsa or the merengue. I saw a video once of a man and his dog doing the merengue...it was incredible. Great review. Due to the fact that I'm a visual Person I felt as though I was there with ya Mary! One of these days will visit San Juan. Not sure when but will happen after your insistence with these hubs and those pcitures. 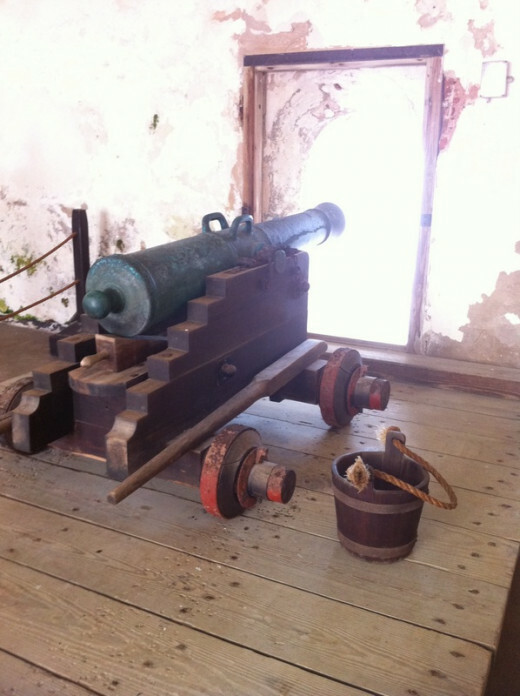 We love History, so that cannon ball topped the cake. Waiting for the second hub in this series. If you move to P.R. You should start practicing salsa or some merengue with 'Wilfrido Vargas" Just a thought. Hey there, teaches12345, I do hope you make it to Puerto Rico someday. You'll be glad you did. Yes, we have a great time on our vacation. Hi AliciaC I'm glad you found my Hub interesting and enjoyable! It truly is a fantastic place, and I look forward to returning maybe this next winter. Yes, Part Two will be published tomorrow. Puerto Rico is on my bucket list, Mary. I loved the tour through your photos and hub. It is good to know that you still do not have to have a passport to visit. It is actually close to where I live, but still so far from reach at the present time. Glad you enjoyed the trip and it went so well. This is an interesting and enjoyable hub, Mary. I would love to visit Puerto Rico. Your description of your experiences is very useful for potential travelers. I'm looking forward to part two of your adventures! I will share this hub. Hi Peggy W. Thanks so much for taking the time to read my day one of our vacation in Puerto Rico. Hey, you know I'm honest: I really did not like the food. I think you have to acquire a taste for it. It is so different from ours. By the time we left, I was able to enjoy it. Thanks so much for the votes and for the wonderful shares! I enjoyed watching that video, too. Someone did a great job with that, I think. Good Morning HBN, so nice to see you. I do hope you'll follow along with me on our wonderful trip to Puerto Rico. Day Two is coming up shortly. Thanks so much for the votes. I do appreciate that. Hi Deborah, isn't Puerto Rico just the greatest?? I returned all by myself (wrote a Hub about that, too). Day two of this vacation will be published today or tomorrow. Watch for it. We will go to El Yungue and the Bioluminescent Bay where you went. I've been to Costa Rica (wrote a Hub about that, too). I enjoyed the countryside more in CR, but for living, I'd have to choose PR. Now the HP followers icon is showing...so definitely sharing! Anyone reading this should definitely take the time to watch that video. You are going to bring a flood of vacationers to Puerto Rico with your great hubs! I hit all the buttons on this one...even funny, because of your descriptions of your early food adventures. Hope that gets better! Ha! This is a fabulous hub regarding your vacation to Puerto Rico! Can't wait to read the next installment. Loved the photos and descriptions. Will sent to FB and Tweet. The share to followers button seems to have disappeared? Would definitely have shared this! Love this new series where you give us in depth information about your trip to Puerto Rico and personalize it with your own photos and travel adventures. Voted up across the board except for funny. You are a true adventurer and so open to new experiences. I went to Puerto Rico a few years ago. 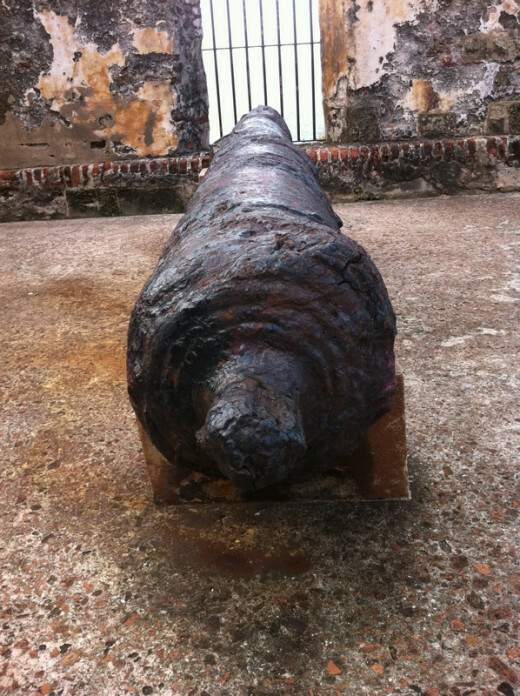 I really enjoyed Old San Juan and touring the fort. We also did a lot of hiking in El Yunque and kayaked in the bioluminescent bay. I also have been to Costa Rica, which I have to say I preferred. How did the two compare for you? I'll be interested to read more about your trip.